Well, 2016 won't be a total wipe-out, after all. From now on, every David Ortiz story involving the Yankees doesn't have to culminate with him leisurely stepping on home plate with his chubby fingers to the sky. There may not be a juju god, but at least we know there is an equilibrium of nature. Call it karma. Call it random sequence. Call it whatever. I call it strike three. 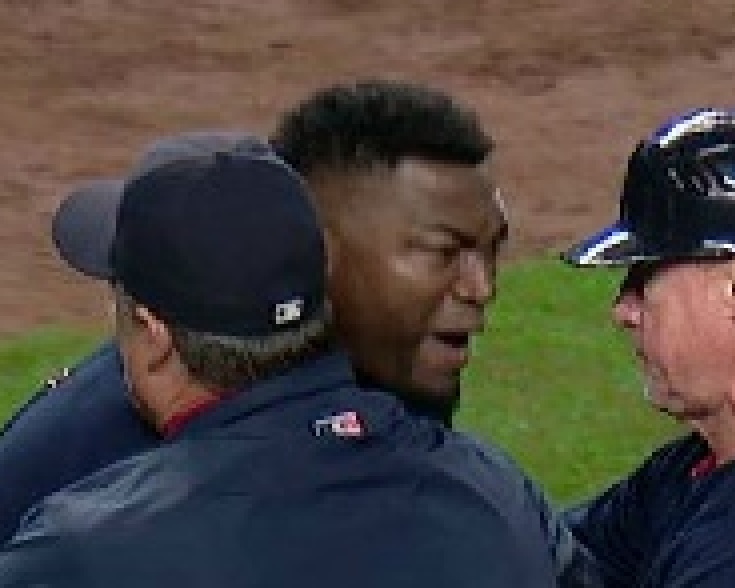 For once, Papi didn't get the benefit of the doubt on an ump's decision, so what happens? He pops like Cory Lewandowski, like a gummy bear in a hydraulic press. He goes Mento-in-Coke, railing against the world with the entitled outrage of a Hitler tweet from Curt Schilling. Ortiz is used to always getting the call. For once, it went our way. Our way. If that pitch had gone against us - (ball four, run scores, game tied) - I have no doubt that we would have lost the game - (Phil Coke was warming in the pen) - and the series - (which we may still lose.) Joe Girardi - who has already this season absorbed more cuts than John Snow - would have been like Faye Dunaway at the end of Chinatown, staring vacantly into Suzyn's eyes and saying, "She's my sister... and my daughter. She's my sister... and my daughter..." Andrew Miller would no longer be Lord Commander of the Night Watch. We'd be waiting for the arrival of El Chapo, the shooter of garages. But the call went our way. Our way. No matter what happens, we'll always have last night. For a first place team, they seem awfully testy, don't they? Wonder what they're serving in the clubhouse this year instead of wings and beer? Am I the only one who thought it was a good call? What happened to make it look way outside was that our catcher was fooled, and wound up having to backhand the pitch way off the outside corner, and practically fell down in doing so. But the ball did cross the plate, at knee level while breaking to the outside. I think when Papi studies the tape, he'll see it was more an illusion ( that it was low and outside, no where near the plate) than a reality. It was a good call by the ump. The 3-1 pitch was a strike. Maybe the 3-2 pitch was low, but too close to take. Big Poopy is a big crybaby. Lord, how I love this blog. I was going to quote my favorite line here, but realized I would end up reprinting the whole thing. Brilliant piece, per usual, Duque. He's always been a big crybaby. No surprise here.